We are excited to introduce a fun new initiative: Italian cooking classes for children! Brought to you by the ICC children's language program, this pizza making event has been designed to be fun and informative for parent and child. Join us on Saturday, February 7th, 12:00 – 2:30 PM as we create pizzas at Rebecca's Authentic Italian Bakery, located at 2111 East Franklin Avenue, #2, Minneapolis. The phone number is 612 455-0236. Cost for this class (1 parent and 1 child) is $35 for ICC members + $17.50 for an additional child; $45 for non-members + $22.50 for an additional child. Raised and trained in Italy, Rebecca’s owner and pastry chef, Asse will guide you through the process and tasting. ICC instructor, Luisa O’Gara will be on hand to provide more information about the origin of pizza, the journey of the ingredients and its popularity around the world. 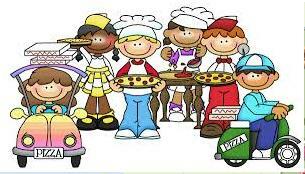 Each parent and child participant will eat their own pizza at the bakery and take one home too! Soft drinks will be provided. Register now: our cooking classes are very popular and fill quickly. Please register and remit payment here. Contact Luisa at luisaogara@hotmail.com for additional information. All events must be cancelled 72 hours in advance to receive a refund, less administrative fee.